Whoops, something went wrong… We’re having trouble playing this title right now. Please try again later or select a different title. Error code: U7353. If you are using Netflix App on Windows 10 computer and frequently receiving “Netflix Error Code U7353” error then I can definitely understand your discomfort situation because I have also faced the exact same Netflix streaming problem (Error code: U7353) a week ago while using Netflix to watch TV Shows online and stream online movies. As we all know, Netflix is one of the most popular and best video streaming services which you can use to stream movies and TV shows online on your PC, laptop, smartphone and even on Smart TV. To make the online streaming process super easy, Netflix has also launched Netflix app for Windows 10 using which you can stream content directly to your Windows 10 system. If you receive Netflix Error Code U7353, it means you won’t be able to watch any movies or TV shows on Netflix which is a quite frustrating situation for many peoples. In order to resume Netflix streaming process, you have to fix Netflix Error U7353 in Windows 10 first. There are many methods available on the web which you can follow to fix Netflix error code U7353 Windows 10 and we have listed the best working ones in our guide of how to fix Netflix error U7353 in Windows 10 PC. According to Windows 10 users, Error code U7353 is one of the most common temporary Netflix streaming problems. So, whenever you see “Whoops, something went wrong… We’re having trouble playing this title right now. Please try again later or select a different title. Error code: U7353” error message, you should simply retry to stream your desired Netflix TV shows or Movies. It should fix the Netflix error U7353. But if it doesn’t work and you see this error U7353 frequently then here are some very helpful solutions which you can try out to fix the Netflix Error cCodeU7353 issue. The Microsoft releases updates for Windows operating systems from time to time which fixes many issues and vulnerabilities of the OS. To resolve Netflix error code U7353, you can check and see if there is any Netflix app update available for your Windows 10 computer. In order to check if there is a Windows update available or not, you have to go to Settings and then open Update and Security. Here you will see Windows Update option. From here, scan for the available update and install it on your system if there is available any. Also, check if there is an update available for Netflix app from Windows Store. To do so, open Windows Store on your Windows 10 computer and then click on your profile photo and then select Downloads and Updates. If there are any updates available for Netflix app, download and install it. You might also like to know: What Does Amazon Prime Have That Netflix Doesn’t? It is possible that wrong DNS settings or if DNS isn’t reachable, you will get Netflix error code U7353 in Windows 10 PC or laptop. 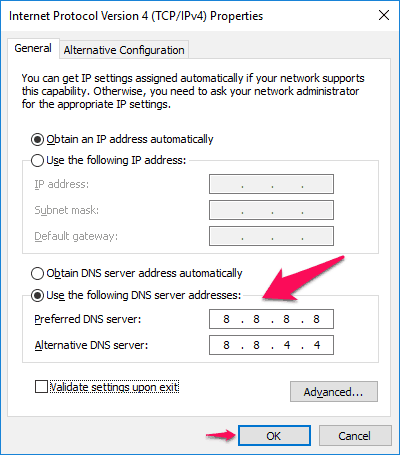 So in this situation, you can either flush DNS or change DNS settings which you are using currently to resolve Netflix error U7353. 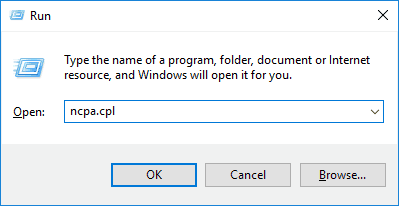 Step (1): First of all, open Run dialog box by pressing Windows + R keys together and enter ncpa.cpl then press Enter key. Step (2): On the Network Connections window, right-click on the network adapter which you are using and the select Properties option.network adapter which you are using and the select Properties option. Step (4): Next, open Internet Protocol Version 4 (TCP/IPv4) by double clicking on it. Step (6): Finally, save the changes by clicking on OK button.OK button. Once you have successfully changed the DNS Settings in Windows 10, now try using the Netflix app again. You shouldn’t encounter any issue now and Netflix error code U7353 should be resolved. If you are still not able to resolve the Netflix error U7353 issue even after following the first two methods then you can go for the method to reset Netflix App and get back to the factory settings of Netflix app. Step (1): At first, open Windows 10 Settings by pressing Windows + I keys together. Now go to System > Apps & Features > Netflix. Step (2): Next, click on the Advanced Options which is located in the Netflix app section. 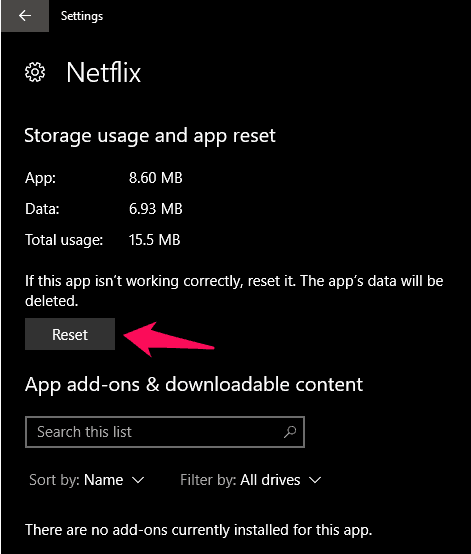 Step (3): Now from the Netflix app settings window, click on the Reset button which will reset Netflix app on your Windows 10 computer. Step (4): After resetting, re-launch Netflix app and sign in again. 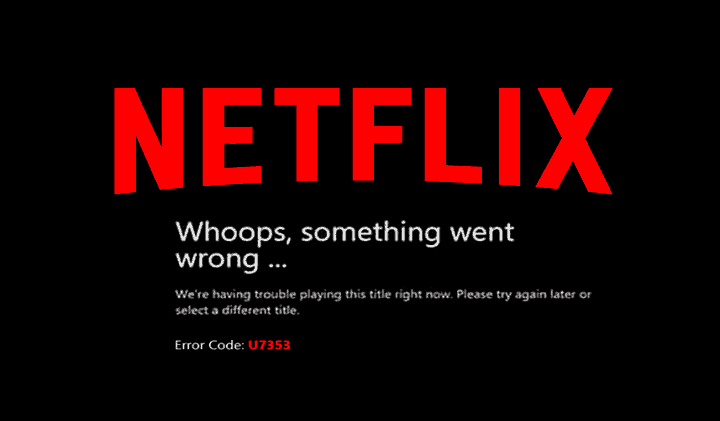 The Netflix error code U7353 should be resolved and you won’t see “Whoops, something went wrong… We’re having trouble playing this title right now. Please try again later or select a different title. Error code: U7353” error message anymore. Thus, you can see how simple is to fix Netflix Error U7353 on Windows 10 system. You haven’t to use any third party software or go through any complex settings, just make few simple adjustments and you are done. Using any of these above three methods mentioned in our guide “How to fix Netflix Error Code U7353 in Windows 10”, you should be able to fix error U7353 in Netflix app. Let us know using the comments section below – Which method helped you in resolving the Netflix Error Code U7353 and Netflix streaming problems in Windows 10?